After taking a much-needed hiatus from the record-keeping, I've decided to join the festivities again at Lee's blog Freshly Pieced for . Sadly, I've also decided to abandon my initial list of UFOs on this forum. It seems that projects for the present and future are taking precedent, which is just fine by me. Talked about in more detail in this blog post. just gotta get those bindings stitched down, looped around and off they go! I've also been receiving blocks from the Design Camp [think outside the block] improv bee, so I'll be looking forward to playing around with those in the coming weeks! So, what's the final count? Thanks for bearing with and taking a look at what I've got going on! If you haven't already, go check out the other updates linking up at Lee's blog! To begin with, I have FINALLY gotten a couple of new items up in my Etsy shop, also titled Surrounded by Scraps. It had been way too long since I had updated that little venue so I am glad to have a little momentum back. The second part of this equation is that I had spent the time I had in my sewing studio before the trip trying to make some new potholders and get the bindings machine sewn on to take with me, INSTEAD of working on the birthday presents, so I figured I'd better actually have that handwork with me to have SOMETHING to show for the oversight! trying to smile for the camera - feeling a bit foolish, I have to admit! The first night it was just J and myself at a campground on the east side of Mt. Hood with a creek running right by. The following day we drove around, back toward Portland to meet up with the rest of our party at a campground on the Sandy River. Fun was had, horseshoes were thrown, pinecones were fetched and breakfast was quite a to-do! As I sit here after a lovely dinner of mac 'n' cheese from a box, watching the last disc of Project Runway Season 1, I am trying to take stock of the activity of the last week or two. And then I'll be linking up with Lee at her blog Freshly Pieced. And it has occurred to me that I have somewhat neglected my Etsy shop in the last few weeks. At the small craft bazaar that Saskia (the lovely and creative environmental chemist behind Base Natural) and I attended in December, I was asked if I had a wider selection of pot holders, and since then I've sold a couple of sets, so it's about time I replenish. I've also added another quilt top to my growing pile of quilt tops awaiting quilting (though I suppose we can call it even with the previous project coming off of that pile!) - the Encapsulated quilt that I had started several years ago in a class with Portland quilt artist and teacher Lee Fowler. And now there's the big sigh of relief. Coming in JUST under the wire is the already too often mentioned Tangerine and Wine quilt! Complete! However, not quite finished... I have it posted to the Flickr group for the Tangerine Tango Challenge but have been struggling with the photos for the MQG call for entries for the 2012 Fall Quilt Festival in Houston. Their photo requirements are strict! And I'm sure I'm overthinking it, but that's my nature. So, I have Wednesday and Thursday to get a couple of good photos of this quilt, with the perfect lighting and not needing any color correction (I've already taken dozens of photos, both full shots and details) in order to make that deadline. Thanks again for showing interest! 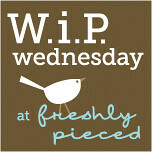 And if you haven't already, it's time to check out the other bloggers linking up for WIP Wednesday! I got the binding finished up on a very slow and slightly snowy day at the quilt shop. A few of these were simply a matter of bindings, but that counts as completed, right?? I still have a fair amount of work on this one before it's ready for the next stage. Here's to a great week ahead, kids!! which, to be fair, looks very much like the photo of the individual blocks displayed on the design wall, found in this post. And then I took a lunch break, and maybe enjoyed an adult beverage, too;-) So, coming back to the studio I spent some time at the ironing board pressing new fabrics and regrouping. But I was not ready to dive in to one of these new projects just yet. So, where does that leave us but finding a NOT-SO-NEW project! I don't know if any of you remember these? a false start I had on that placemat commission that ended up looking like this. Though I had decided that this wasn't right for the client, I still like 'em, so I stowed them away for a bit. One of the issues that had come up initially is that one of the placemats ended up short. And I didn't have enough of the focus fabric to scrap the large piece and cut a replacement. So, what does one do with 2 discarded placemats, one of which is too small to be useful as such? Why, cut them into a pair of pot holders, of course!! As for quilting them, I went against the grain (no pun intended). For pot holders I generally use a simple, straight line quilting, because let's be realistic, no one cares how fancy the quilting is on the tool you're using to pull the casserole from the oven, right? But this fabric gets me every time! I was drawn in by the little vines and leaves on the print, and it evolved into an actual feather quilting motif! Who'da thunk it? And can you believe this was my first foray into free-motion quilting on the Bernina?!? Though I prefer my trusty Viking in SO MANY WAYS, I do have to concede that this machine handled Beautifully with FMQ!! Not even any tension issues on the bobbin thread, which I find inconceivable! However, that said, these might not be so practical as pot holders any more! Just one of the sacrifices we'll make to push our creativity, I guess. There is nothing like having a specific goal (read "deadline") to compel me to get s*** done. My thimble finger is about to get quite the workout! My new schedule allots Thursdays to working on bee and swap projects. Last week I worked on blocks for the do.Good Stitches bee on Flickr. Megan, a.k.a. Canoe Ridge Creations, posted a tutorial on her blog for a simple as pie bow tie block. She showed us an array of clear, saturated, rainbowy fabrics as inspiration for the palette... which seems to be a trend right now. Not an unwelcome one, I must say. In addition to the bow tie blocks, I dedicated quite a bit of time to cutting squares for the Warm Cool Quilt Along hosted by Jeni at In Color Order. I shared a little more about this process in my previous post, found here. This week, however, I moved on to working on 2 other projects, one of which I thought the deadline had passed me by. The Portland Modern Quilt Guild is putting together a banner to represent the group at the annual Sisters' Outdoor Quilt Show in Sisters, OR, along with a selection of member quilts which will be on display at the show this year (the second Saturday of July, for those who are interested!!). Admittedly, I did not get the memo in time to submit (have I mentioned that I am terrible at keeping up with my blog list and online newsletters??) so I do not have a quilt in the show, but several of my Portland colleagues will, along with hundreds of other Oregon quilters! However, I did get a chance to do a block to be added to the banner for the guild, which I dropped off at this evening's meeting. I kept going back and forth about what design I would want to use to sum up my quilting style in one 6" block, sketching ideas, but came up with this simply by revisiting my own Flickr photostream. I originally did a quilt from one of Judy Hopkins' books (whose name escapes me right now, I have to admit) several years ago as a wedding gift for some friends. But the bulk of the day was dedicated to working on Cruz's blocks for the Seams Perfect Scrap Bee on Flickr. She pointed us toward this tutorial from Freshly Pieced. I LOVED working on these blocks, though was thrown off by how long it took to actually select each round of 3 fabrics! And I do have to say that it was a challenge to keep my hexagon blocks even as I went around, as can be seen by the wonky angle of a couple of the strips, but hopefully it won't make too much of a difference. Next month is my month to host that bee, and I still have to get my sample blocks and templates together before the end of June, as I think I will have to send out bits for paper piecing... more to come on that one later. All in all, I think this will be a good schedule to keep to, assuming I am able to keep to it!